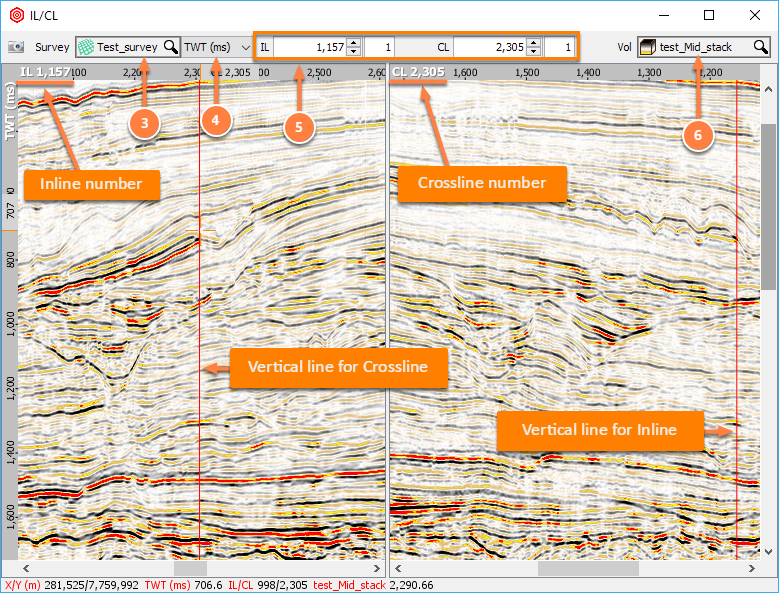 The IL/CL View displays trace information for a selected inline (IL) and crossline (CL) pair in a 3D survey. The IL/CL View is similar to other section views, with the window is split vertically into two panes. Open multiple IL/CL Views to display and compare the volume at different locations, or even to display different volumes (see Opening Multiple Views). When multiple surveys are loaded, the IL/CL view can display data along the inlines or crosslines from any of the surveys. When the view intersects volumes from different surveys, interpolated data will be displayed. This simplifies comparisons between overlapping 3D volumes from different surveys. From the View menu in the Control Panel, select the IL/CL View. See Navigation bar in Views for details on using the common navigation controls. At the navigation bar of the view, select the relevant survey in the Survey box. Note: The survey drop-down box is visible if there are two or more surveys available in the project. Select the time/depth domain (TWT, TVDSS or flattened) to display. Select the IL and CL locations you want to view. Note: Dashed box and italic value represents an interpolated location. move the navigation handle (red vertical line) on the IL or CL panel. The left panel shows IL while the right panel shows CL. The top axis of the CL panel shows the IL number whiles the top of the IL panel shows the CL value. When the IL or CL box changes value, the red vertical line in the IL or CL panel will also move accordingly. The indicator of the current location is shown at the top left corner of each panel. For more information on using multiple views, see Opening Multiple Views and Linking Multiple Views. The IL/CL view provides selection of the 3D survey if there are two or more 3D surveys available in a project. In the IL/CL view, select the 3D survey from the survey drop-down box. If the survey and IL/CL selected for display do not intersect the volume, the IL/CL view will not show any data. Make sure that the correct survey is selected for the corresponding volume. 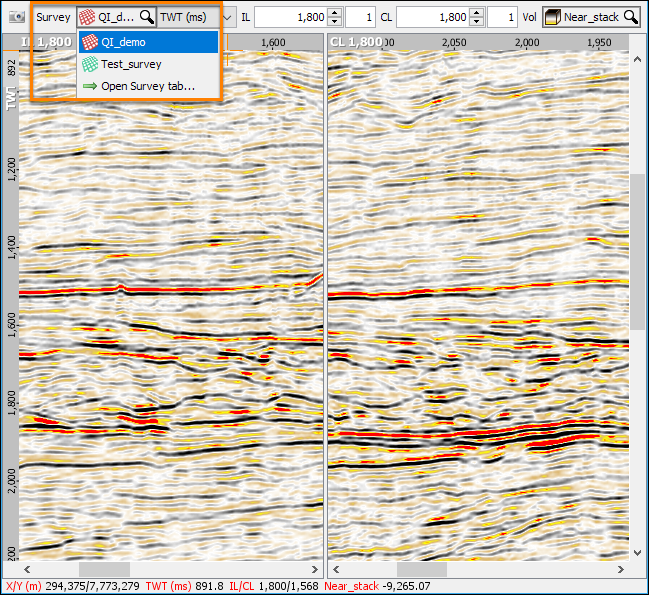 Note: The survey selector is only visible if there are two or more 3D surveys loaded in the session.